Study of pharmacokinetics of quercetin (Qu) and its derivatives after infusion is required in order to better understand mechanisms of therapeutic action of the formulation and development the strategic approaches to treat the underlying disease and pathologically similar syndromes. A pharmacokinetic study of Qu products is a complex analytical problem. We developed and validated a new method for quantification of Qu and its metabolites in human plasma and urine following intravenous administration of Qu formulation. The method is based on the solid-phase extraction with the help of Oasis® HLB cartridges and ultra-performance liquid chromatography - tandem mass spectrometry (UPLC-MS/MS) quantification. The calibration curves plotted for concentration range of 25–3000 ng/ml for Qu and isorhamnetin in blood plasma and of 100–8000 ng/ml for the same substances in urine were best described by a quadratic function. Qu conjugates underwent preliminary hydrolysis by the mixture of enzymes of sulphatase and β-glucuronidase. The antioxidant L-cysteine mixed with ascorbic acid was used for stabilization of Qu and its metabolites during handling of samples and chromatographic runs with mass detection. The method validation as well as the stability study results confirmed that the developed method meets the established requirements (selectivity, lower limit of quantification, accuracy, precision, recovery). The main pharmacokinetic parameters of Qu and its metabolites were determined in blood plasma and urine after intravenous administration of Corvitin® (parenteral formulation combining Qu and polyvinylpyrrolidone at a ratio of 1:9) in 12 healthy volunteers. We showed that the method development for Qu quantification in biological matrixes is valuable and reliable. Quercetin [3,3′,4′,5,7-pentahydroxyflavone] is a natural bioflavonoid. Oral medical Qu products and dietary supplements containing Qu are used in medical practice, and their pharmacokinetic studies are described . Qu parenteral formulations currently are not widely used, which, most probably, is related to poor solubility of Qu. The original medical Qu formulation Corvitin® manufactured by SIC Borshchahivskiy Chemical-Pharmaceutical Plant CJSC (Ukraine) is a combination of Qu with polyvinylpyrrolidone at a ratio of 1:9. The formulation is produced as a porous lyophilized powder of 500 mg in a sterile vial and administered by intravenous infusion in physiological saline solution. Corvitin® is used as a cardioprotector in therapy of acute coronary circulation failure and myocardial infarction, in therapy and prevention of reperfusion syndrome in surgery of patients with obliterating atherosclerosis of abdominal aorta and peripheral arteries. Pharmacokinetics study of Qu and its derivatives after infusion is required in order to better understand mechanisms of therapeutic action of the formulation and development the strategic approaches to treat the underlying disease and pathologically similar syndromes. A pharmacokinetic study of Qu products is a complex analytical problem. Qu is an easily oxidized substance, especially in neutral and alkaline media, thus, it is necessary to use effective antioxidants for preparing samples and performing further analysis. Moreover, Qu is rapidly metabolized in the body to methyl derivatives, various glucuronic and sulphate conjugates and their various combinations [2–5]. Qu and its metabolites are characterised by pronounced pharmacological activity [6–10], thus, in pharmacokinetic studies it is necessary to determine both free Qu and its metabolites. For quantitative determination of conjugated Qu in the form of glucuronide and sulphate derivatives, the method of enzymatic deconjugation is preferred . At this point it is necessary to take into account that a part of Qu is metabolised to the form of methyl derivatives, and especially 3′-О-methylquercetin (isorhamnetin, Ir), 4′-О-methylquercetin (tamarixetin) and their conjugates . That is why during a bioavailability study of Qu products it is required to quantify the deconjugated methyl derivatives of Qu, which is difficult in vitro because of reverse conversion to Qu by fermentation. A pharmacokinetic study of three doses of an oral Qu product, where it was assayed in healthy volunteers’ blood plasma by using HPLC with a fluorescent radiation detector is described in , and meanwhile both sulphate and glucuronide conjugates of Qu, and its methyl metabolites and their conjugates were determined. The use of HPLC–MS/MS to determine Qu and its conjugates in blood plasma and urine after oral administration is described in . Bioavailability of Qu and rutin after oral and parenteral administration in rats was studied in . Both pharmacokinetics of free Qu and its conjugates, but not methyl derivatives of Qu and their conjugates, were determined in these two studies. The first study of Qu pharmacokinetics after intravenous administration at a dose of 100 mg with ethanol vehicle was performed in 1975 , however, selective methods (HPLC) for quantitative determination of Qu were not used. According with , Qu concentrations in blood plasma and urine after intravenous administration of Qu dissolved in water-dimethylsulfoxide (1:1) mixture was determined by HPLC using UV-detection, and at that point only free Qu (non-conjugated) was assayed. In this study, the solution of Qu in the mixture of water-dimethylsulfoxide was obtained immediately before administration, i.e. ‘ex tempore’. Dimethylsulfoxide affects not only the solubility of Qu, but also its bioavailability, and administration of Qu products in the form of water-dimethylsulfoxide solution results in adverse reactions in patients , and that, in all likelihood, was the reason for not introducing the investigated drug to market after the study. In order to carry out the scheduled study, the method of ultra performance liquid chromatography (UPLC) with tandem MS/MS detection was used. 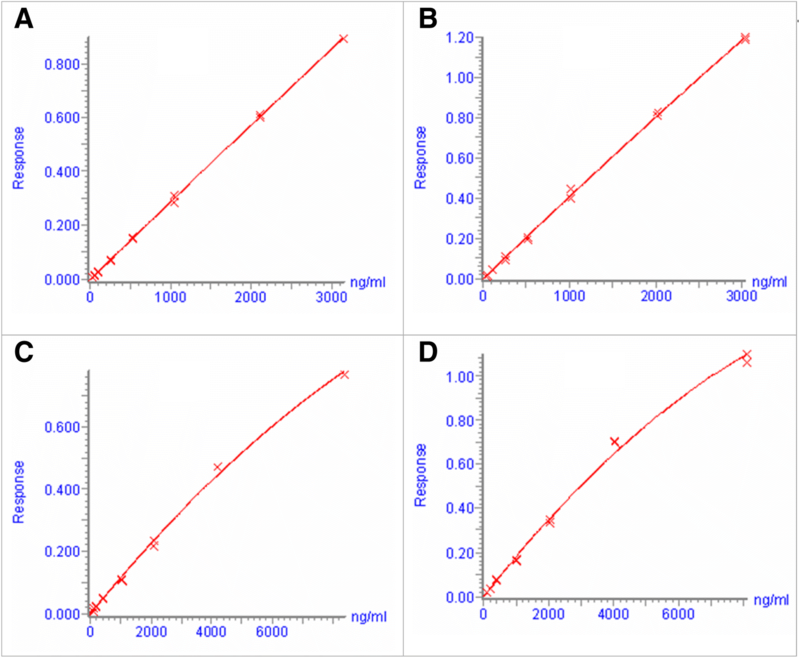 This article describes the development and validation of a UPLC–MS/MS method for quantitative determination of Qu and its metabolites in blood plasma and urine of healthy volunteers. We believe that we are the first ones to perform a pharmacokinetic study of the commercial Qu formulation for intravenous administration currently used in medical practice. Quercetin dihydrate (100.0% purity) and internal standard (IS) fisetin (99.0% purity) were obtained from Sigma, isorhamnetin (99.6% purity) – from Fluka, powder of the mixture of enzymes of sulphatase and β-glucuronidase (source - Helix pomatia), type Н-1 (AS = 20,560 units/g; AG = 2,701,900 units/g) was obtained from Sigma, Corvitin®, lyophilized powder for injection, 0,5 g in vials was provided by SIC Borshchahivskiy Chemical-Pharmaceutical Plant CJSC (Ukraine), batch # 1280408. Methanol and acetonitrile (AcN) both 99.9% of HPLC-grade were obtained from LAB-SCAN, formic acid 98–100%, puriss. p.a. from Riedel-de-Haen. All other chemicals were of analytical grade. Water was purified by Elix-35 (Millipore, USA) with final purification using Milli-Q Gradient (Millipore, USA). Oasis® HLB 96 well cartridges, 10 mg packing, grain size - 30 μm (Waters, Milford, MA, USA) also were used. Drug-free human plasma from healthy volunteers was provided by JCC Biofarma, Ukraine, each batch was accompanied by a certificate of analysis and was stored at − 30 °C prior to use. Chromatography was performed in gradient mode. Solvent А: AcN – water – formic acid (10: 90: 0.2, v/v/v), solvent В: AcN – formic acid (100: 0.2, v/v). The LC–MS/MS analyses were performed using a Waters Acquity UPLC® system with a Waters ACQUITY UPLC® BEH С18 columns (50 mm × 2.1 mm, 1.7 μm) (both Milford, MA, USA) in combination with a Quattro Micro API triple quadrupole mass spectrometer (Micromass, Manchester, UK) equipped with an electrospray interface. MassLynx 4.1 software was used for instruments control and data processing. Chromatography was performed at 40 °C at a flow rate of 0.4 ml/min with a total run time of 1.4 min. The start mobile phase consisted of 78% solvent A and 22% solvent B and the linear gradient run over 1 min up to 46% A, 54% B. Then composition was set immediately at 100% B and held constant 0.15 min, followed back to 22% B. The autosampler was kept at 5 °C and 40 μl samples were injected. Data acquisition was performed in the positive ion mode. The capillary voltage was set at 2000 V, the source temperature was set at 100 °C and the desolvation temperature was set at 500 °C. The desolvation gas flow (nitrogen, 99.5%) was set at 750 L/Hr, the collision gas pressure (argon, 99.99%) was set at 3.5 μbar. Detection of the ions was performed in the multiple reaction monitoring mode (MRM), monitoring the ion combinations of m/z 302.8 ➔ 152.7 amu for Qu, 316.8 ➔ 152.7 amu for Ir and 286.9 ➔ 136.7 amu for fisetin (Fs). The collision energy was set at 34, 40, 30 V and the cone voltage was set at 45, 40, 45 V for Qu, Ir and Fs respectively. These MRM-method parameters were determined by using Autotune option. A reference standards of Qu or Fs (about 5 mg) or Ir (about 2.5 mg) were accurately weighed, put into a 10 ml volumetric flask, dissolved in ethanol containing 0.01% of butylhydroxytoluene in an ultrasonic bath while heating up to 50 °C (stock solution). Shelf life of Qu and Ir solutions was 3 months, for Fs solution shelf life was at least 22 days when kept at + 2 to + 7 °C. The solution of the Qu and Ir mixture for calibration solutions were prepared by mixing and appropriate dilution of stock solutions by using water-AcN (3:1) mixture containing 0.005% ascorbic acid and 0.2% L-cysteine as solvent. Meanwhile Qu and Ir mixture solutions were obtained with the following concentrations of each analyte: 500; 1000; 1500; 2000; 3000; 5000; 10,000; 15,000; 20,000; 40,000; 60,000 ng/ml. An Fs solution (subsequently was used as IS) with a concentration of 8000 ng/ml was prepared from the Fs stock solution by diluting with the abovementioned solvent. The solutions were kept at a temperature + 2 to + 7 °C. The calibration solutions and QC solutions based on the respective blank plasma or urine were prepared by adding 23 ml of the antioxidant solution (aqueous solution containing 10% ascorbic acid, 4% L-cysteine and 2% formic acid), 20 μl of respective solution of the Qu and Ir mixture and 40 μl of the IS solution to 400 μl of plasma or 100 μl of urine mixed with 300 μl of sodium-citrate buffer solution рН 5.0 in Eppendorf tubes (1.5 ml). The solutions were vortexed and then the samples were prepared as described in Section ‘Preparation of biological samples’, beginning with adding 800 μl of cooled 0.5 М solution of H3РО4, containing 1% ascorbic acid. As a result, the calibration solutions containing Qu and Ir analytes in concentrations of 25; 50; 100; 250; 500; 1000; 2000; 3000 ng/ml and QC solutions of the same analytes in concentrations of 75; 150; 750; 2000 ng/ml, calculated with reference to the content in plasma, as well as the calibration solutions containing Qu and Ir analytes in concentrations of 100; 200; 400; 1000; 2000; 4000; 8000 ng/ml and QC solutions of the same analytes in concentrations of 300; 3000; 6000 ng/ml calculated with the reference to the content in urine, were obtained. The Fs IS concentration in all the solutions based on plasma was 800 ng/ml, and in those based on the urine was 3200 ng/ml, with the reference to a corresponding biological matrix. Two equal aliquots were sampled from fresh thawed biological samples; one of them was subjected to enzymatic deconjugation; at the same time, the second aliquot was kept in a freezer at a temperature no higher than - 35 °C. 30 min before the end of enzymatic deconjugation, the frozen aliquots were thawed at room temperature. All the biological samples for analytical run, calibration and QC solutions were simultaneously treated. In order to analyse routine plasma samples, two 400 μl aliquots were sampled; to analyse urine samples, two 100 μl aliquots were sampled; those were placed into Eppendorf tubes (1.5 ml). 300 μl of sodium-citrate buffer solution рН 5.0 were added to the urine samples and solutions were vortexed. 23 ml of the abovementioned solution of antioxidants and 40 μl of the respective IS solution were added to all the solutions. The solutions were vortexed. To each test tube with a sample for enzymatic deconjugation the 10 μl of 5% solution of enzyme F H-1 in sodium-citrate buffer solution рН 5.0 were added, and the solution was vortexed. Incubation was performed in a water bath at (+ 37 ± 1) °C for 17 ± 0.1 h. Immediately after incubation 800 μl of cooled to 0 to + 4 °C 0.5 М solution of H3РО4, containing 1% of ascorbic acid was added to these samples, as well as to the second part of the samples, which were kept in a freezer during the incubation and thawed before examination, and the solutions were vortexed. The tubes with the samples were centrifuged at 28600 g for 10 min (the centrifuge was pre-cooled to 10 °C). The content of each tube was transferred by an automatic pipette to a respective cell of an Oasis® HLB cartridge prewashed with 500 μl of 0.5 M solution of H3PO4 and, by creating “slight” vacuum, the solution was passed through the sorbent at a rate of about 0.2 ml/min. 500 μl of 5% solution of methanol in 0.5 M H3PO4 was added with the help of the automatic pipette to the same cells, the cells were kept for 1 min and drained under “slight” vacuum. Then 200 μl of 50% solution of methanol in 0.5 M H3PO4 was added to the same cells by the automatic pipette, the cells were kept for 1 min and drained under vacuum till complete exsiccation of the sorbent. In the apparatus for vacuum filtration, the collection tray for washing solutions was replaced with a collector dish. Into each used cell of the Oasis® HLB cartridge, 300 μl of methanol was poured, and they were kept for 1 min and then eluted into the collector dish, creating “slight” vacuum. The elution procedure was repeated one more time under the above conditions. To each used cell of the collector dish, 800 μl of water solutions of ascorbic acid, L-cysteine and formic acid with concentrations of 0.005, 0.002, and 0.2%, respectively, were added. The solutions in the cells were stirred by pipetting, and the air-tightly closed dish was taken for recording chromatograms. The validation of the developed method for determination of Qu and Ir, as well as its sulphate and glucuronide conjugates in blood plasma and urine was performed in accordance with . The validation covered the following parameters: selectivity, lower limit of quantification, calibration curve, within-run and between-run precision and accuracy, recovery, dilution procedure of biological samples of blood plasma, and stability. In order to determine the selectivity, we used three different batches of respective blank biological matrices added with Qu and Ir in amounts corresponding to the LLOQ (25 ng/ml calculated with the reference to the content in plasma or 100 ng/ml calculated with the reference to the content in urine), and IS at concentrations that were mentioned above in Section ‘Preparation of standard and QC solutions’. In order to determine the lower limit of quantification (LLOQ), we prepared 5 different solutions based on respective blank biological matrices added with Qu and Ir in amounts corresponding to the LLOQ and Fs IS, obtaining Fs concentrations of 800 ng/ml in plasma, and 3200 ng/ml in urine. The chromatograms of the obtained solutions, as well as solutions of blank plasma and urine, prepared as described above, were recorded and the peak areas in the respective chromatograms were compared. In order to determine parameters of the calibration curve, while determining analytes in plasma and urine, respectively 8 and 7 calibration solutions with concentrations specified in Section ‘Preparation of standard and QC solutions’ were used. In order to assess the parameters Precision and Accuracy five QC-solutions of each concentration were prepared; meanwhile four concentrations in plasma and three concentrations in urine were used (see Section ‘Preparation of standard and QC solutions’). The experiment was carried out on three separate occasions. Within-run and between-run precisions were calculated by using the formula %R.S.D. = (S.D./M)(100), where M is the mean of experimentally determined concentrations and S.D. is the standard deviation of M. Accuracy was calculated using the formula %RE = |(E − T)(100/T)|, where E is an experimentally determined concentration and T is a theoretical concentration. Recovered Qu and Ir were assessed at three concentration levels for plasma and at four concentration levels for urine. The analyte and IS concentrations of the replicate QC samples (n = 3) are given in Section ‘Preparation of standard and QC solutions’. The peak areas of extracted samples with the blank biological matrices extracts fortified with the drug post extraction were compared. The validity of the fivefold dilution procedure for the model biological samples with blank plasma was assessed by Precision and Accuracy parameters . 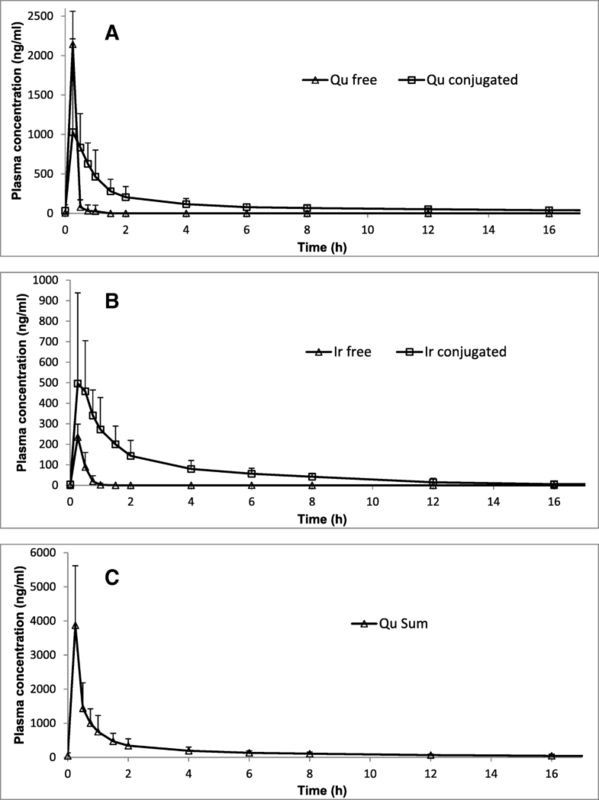 Three different concentrations of Qu and Ir (about 2500, 5000 and 10,000 ng/ml for each analyte in plasma) were evaluated by analyzing five aliquots of each concentration. Using three and four concentration levels, each type of stability specific for bioanalytical methods was studied : short-term stability, freeze-thaw stability, bench top stability, long-term stability. The analytes and IS concentrations of the replicate QC samples (n = 3) are given in Section ‘Preparation of standard and QC solutions’. All the samples for stability studies were prepared on the basis of blank biological matrix spiked with respective amounts of the analytes in a mixture of water–AcN (3:1), containing 0.005% ascorbic acid and 0.2% L-cysteine. All samples were analyzed immediately after preparation and after the applied storage conditions. The short-term stability was examined following sample defrosting and 4-h incubation at room temperature. The freeze-thaw stability was examined after three freeze-thaw cycles. The long-term stability was determined by analyzing three samples at each concentration level stored at − 70 °C for 108 days. The stability of the samples processed in autosampler was examined after 18 h. Stability of the stock analytes solutions was assessed after 3 month storage and of the stock IS solution – for 22 days when kept at temperature of + 2 to + 7 °C. During the development of the method, we investigated the time required to sufficiently complete enzymatic deconjugation of glucuronide and sulphate derivatives of Qu. Meanwhile, the completeness and stability of formed aglycones were evaluated using biosamples obtained from the subjects loaded with a dose of an active substance. An enzyme solution was added to two routine samples collected 2 h after the administration of the formulation, and they were incubated at 37 °C for 17 h, 20 h and 23 h. The further preparation of samples and their analysis were carried out in accordance with the method which was described above. The pharmacokinetic study of injectable medicinal product Corvitin® was carried out (March–April, 2009) in accordance with the Declaration of Helsinki, GCP and GLP requirements. The trial was registered in the Ukrainian national registry (Resolution of State Pharmacological Center of Ministry of Healh of Ukraine #741/2.2.1–5 from 10.02.2009). Before the study the sponsor monitoring on GCP requirements was held, also the State Expert Center of Ministry of Health of Ukraine audits are conducted on regular basis (The audit before the trial was conducted in November, 2008). The protocol and associated informed consent forms were reviewed and approved by The Ethical Committee and the informed consent forms were signed by the volunteers prior to the study initiation. Twelve healthy volunteers (aged 18–45) years of both sexes were enrolled in the study. In order to carry out the study, each volunteer was given the formulation (combination of Qu and polyvinylpyrrolidone at the ratio of 1:9 in form of porous lyophilized powder of 500 mg), which was diluted with 50 ml of sterile physiological solution 2 h before administration, by using infusion pumps ensuring the same speed of intravenous injection. The dose was calculated individually on the basis of a body surface area of volunteers at a rate of 250 mg of the formulation per square meter of body surface. Thus, administered doses of the product were 365 to 528 mg (37 to 53 ml of the solution). Thirteen blood samples were drawn from each subject during the study, 5.5 ml of blood at each study time point. The blood sampling was conducted according to the following schedule: 0 h (pre-dose), 15, 30 and 45 min, and 1, 1.5, 2, 4, 5, 6, 8, 12 and 24 h post-dose. The samples were put into 6 ml plastic vacuum tubes pre-treated with sodium heparin and centrifuged within 3 min after collection. The centrifugation was conducted in the temperature-stabilized rotary chamber at 10 °C for 5 to 6 min at 4000 g. The obtained plasma was acidified (1 ml of plasma was added with 0.05 ml of 0.25 М solution of acetic acid). The plasma was divided into two aliquots (the first one was for the analysis, the second one was for the back-up) but the volume was not less than 1.2 mL for each aliquot, which were transferred into the pre-labeled cryotubes. The plasma was kept at a temperature below − 70 °C at the study site and at the bioanalytical laboratory as well. The time period between blood collection and plasma transfer into − 70 °C freezer did not exceed 15 min. The sampling of urine was performed as follows. The volunteers were given a labelled container for urine collection for each period of time (0–3 h, 3–6 h, 6–9 h, 9–12 h, 12–16 h, 16–24 h). The urine collection was done ‘on volunteer’s demand’. Before receiving an aliquot, a container was kept at temperature + 4 °С. The volume of total urine obtained over the specified period was measured by using a graduated cylinder. Then the urine was mixed, and two 5 ml aliquots were taken as soon as possible (the first aliquot was for the analysis, the second one was for the back-up), then they were immediately frozen and kept at a temperature below − 70 °C. From the clinical site to the bioanalytical laboratory, the frozen samples were transferred in secondary containers put in cryoboxes filled with “dry ice” (solid carbon dioxide). The developed method was used for quantification of total Qu (QuTot), obtained after enzymatic hydrolysis, unconjugated (non-hydrolyzed) Qu (Qu2), conjugated Qu1 = QuTot – Qu2, and methyl metabolites of Qu with reference to Ir: total one (IrTot), obtained after enzymatic hydrolysis, unconjugated Ir (Ir2) and conjugated Ir1 = IrTot – Ir2 in biological matrixes. Additionally, we determined the amounts of total bioavailable Qu, i.e. 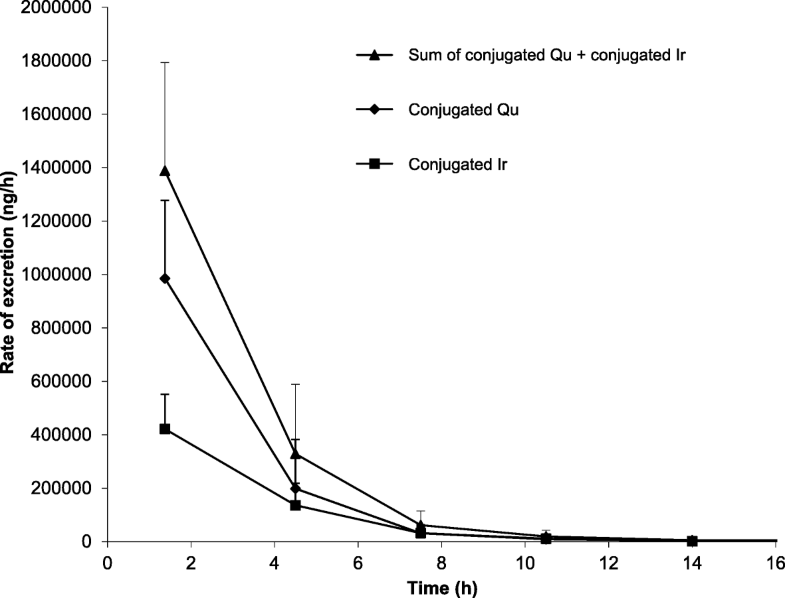 QuSum = QuTot + 0.95567*IrTot in order to assess bioavailability of Qu from the formulation of Corvitin®. 0.95567 is a conversion factor of Ir to Qu, taking into account the difference between their molecular masses. The pharmacokinetic profiles were obtained for every volunteer. The findings of Cmax and Tmax were obtained by applying the common statistics. The data analysis of pharmacokinetic parameters for Qu in the blood plasma was performed with the help Win-Nonlin professional software version 5.2 (Pharsight, Mountain View, CA, USA) using non-compartmental approach to the model assessment of NCA Model 202 (continuous infusion). The infusion time 15 min was taken into account. Area under the plasma concentration curve (AUC0–24) values (t being the time of the last plasma concentration measured) were calculated by the linear trapezoidal rule. The AUC from 0 to infinity (AUC0–∞) was calculated by the software. The first-order rate constant Kel was assessed by linear regression of time vs log of the concentration. Terminal half-life (T1/2) was also calculated. The pharmacokinetic data on determination of Qu in the urine were treated by using the model assessment of NCA Model 212 of the same software. Using the least-squares method and log-transformed data of excretion rate (R) of the substance in the urine, the elimination constant Kel. (R) and half-life T1/2(R) were assessed. The excretion rate of the test substance in the urine was calculated for each of n time periods (time of the beginning of a period – Tn-1, time of the end of a period – Tn) by the formula: R = C*V/(Tn - Tn-1), where С is a concentration of analyte in the urine, in ng/ml, V is a volume of urine in the specified time period in ml. Also the weight (М) in μg of eliminated Qu within this time period in the urine was calculated: M (μg) = С × V/1000. It should be noted that according to the study protocol, the first time period of sampling urine was stated from 0 to 3 h. However, the infusion of the formulation continued as per protocol for 15 min (0.25 h). Thus, the actual first sampling period was from 0.25 h to 3 h, which was taken into account in the further calculations (the mean of the first period was 1.63 h). For plotting graphs of concentration vs time for Qu in urine, as well as the excretion rate of Qu in urine, midpoints of urine sampling periods were used. The other pharmacokinetic parameters: Rmax, ТRmax, AURC0—t, AURC0–∞, cumulative excretion of the substance in the urine Ае, and mass of Qu excreted in the urine were assessed also. We used fisetin (Fs) as IS for this study. Fs (3,3′,4′,7-tetrahydroxyflavone) differs from Qu by one hydroxyl group, which is missing in position 5. It has similar physical and chemical properties, chromatographic behaviour of the analytes, and is absent in the human plasma at the endogenous level. Fs was successfully used earlier as an IS for HPLC MS/MS determination of Qu and its sulphate and glucuronide conjugates . The structural formulae of the specified substances are shown in Fig. 1. A gradient: methanol-water solution of trifluoroacetic acid was used for chromatographic separation of glucuronides of Qu in paper . The gradient based on acetonitrile-water solution of formic acid was used for chromatographic separation of Qu metabolites in the paper . We used a similar to the latter gradient for chromatographic separation because a gradient elution mode demonstrated better results than an isocratic mode. The chromatographic conditions and parameters of detection are given in Section ‘Instrumentation and methods’. The time of data registration was 1.4 min. A chromatographic run continued for 1.9 min, including the time of sampling. The short time of recording chromatograms allowed injection of each test sample twice; the result was calculated as a mean of two parallel injections. The UPLC chromatography allowed significant reduction of time for recording chromatograms comparing with traditional НРLC. The chromatograms of blank plasma, blank urine and LLOQ standards for plasma and urine are shown in Fig. 2. Qu can be easily oxidized during preparation of samples, storage of the solutions, and MS-detection as mentioned in Section ‘Introduction’. To prevent oxidation of Qu we tried various concentrations of ascorbic acid, which was added to Qu and Ir solutions. Increasing concentrations of ascorbic acid, however, did not give any positive effect to stabilize of Qu. At the same time using L-cysteine mixed with ascorbic acid as antioxidant led to the stabilization of Qu and Ir both during handling of samples and chromatographic runs with mass detection. Higher efficiency of L-cysteine as antioxidant can be explained by greater negative reduction potential of the cysteine/cystine system then in the ascorbic acid/dehydroascorbic acid pair . Antioxidant concentrations used at each step of handling of samples are given in Section ‘Preparation of standard and QC solutions’. According to our data, the effective method proposed to stabilize of Qu and Ir in solutions was used for the first time. We used a procedure of solid phase extraction by using Oasis® HLB cartridge after pre-dilution of samples with 0.5 М solution of phosphoric acid  to improve the separation of the analytes. As mentioned in Section ‘Introduction’ investigation of pharmacokinetics of Qu products requires determination of both free Qu and its metabolites – methylated derivatives and sulphate and glucuronic conjugates. In order to assay total glucuronide and sulphate metabolites they were enzymatically deconjugated. Since methylated Qu derivatives are resistant to enzymes, calibration curves were built with Ir standards for quantification of this kind of compounds. It was found that enzymatic deconjugation of Qu and methylquercetin derivatives lasted for 17 h and this time interval was used in all the further experiments for deconjugation. It was established that LLOQ of Qu and Ir were 25 ng/ml in blood plasma and 100 ng/ml in urine for each analyte. At that the signal/noise ratios in plasma were: for Qu > 8.2, for Ir > 7.6; in urine: for Qu > 45.4, for Ir > 100.4. These results meet the acceptance criteria of ≥5 . Qu and Ir concentrations at the LLOQ level were determined at accuracy (RE < 14%) and precision (RSD < 17%), which meet the established criteria  for both parameters (≤20%). The method selectivity was demonstrated by using 3 different batches of respective blank biological matrices spiked with Qu and Ir at LLOQ amounts, and with IS Fs with appropriate concentration. The ratios of peak areas in the chromatograms of solutions of blank biological matrix and solutions for determining selectivity were the following: for plasma samples: Qu < 0.161, Ir < 0.149; for urine samples: Qu < 0.259, Ir < 0.224, which meet the criteria established by our laboratory (< 0.5). The calibration curves for plasma and urine are shown in Fig. 3. The results of blank and zero samples were not taken into consideration when constructing the calibration function. The most adequately all the calibration curves are described by using a quadratic model with the weighting factor of 1/X (i.e., 1/concentration). The values of coefficients of the regression equation of the calibration curve Y = a∙X2 + b∙X + c that were determined during the method validation of assay of Qu and Ir in plasma and urine are given in Table. 1. The table shows that the coefficients of determination (R2) were greater than 0.990 in all the determinations. The back calculated concentrations of the calibration standards complied with the acceptance criteria . When assessing the parameters Precision and Accuracy for quantification of Qu and Ir in plasma, it was established that the R.S.D. (both intra- and inter-run) for Qu was not greater than 14.5%, and for Ir – 11.6% at the value of accuracy for Qu and Ir not greater than 6.8 and 9.7%, respectively. It was established that R.S.D. (both intra- and inter-run) for Qu was not greater than 9.4%, and for Ir – 6.9% at the value of accuracy for Qu and Ir not greater than 7.5 and 6.5%, respectively for quantification of Qu and Ir in urine. 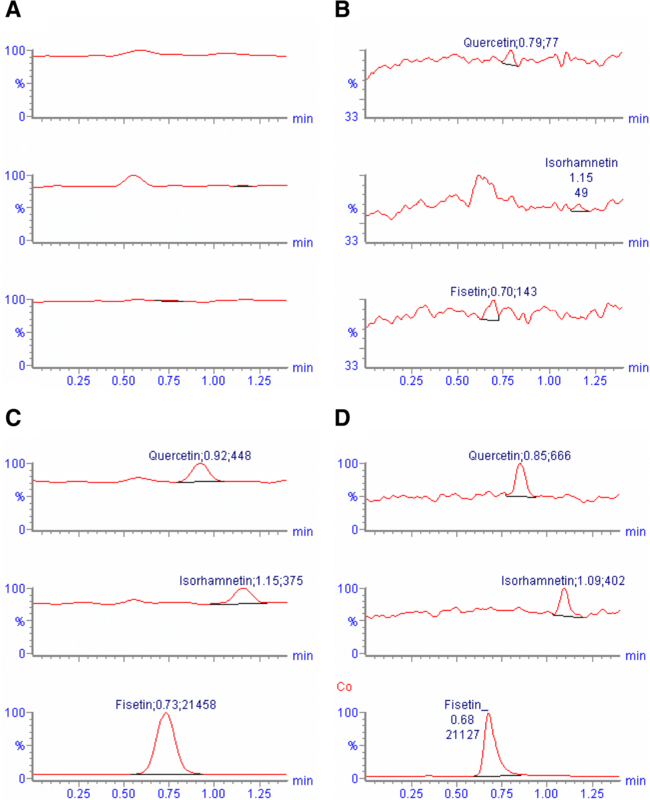 The recovery values of Qu and Ir from plasma were of 61.8–65.5% and of 73.5–76.9%, respectively. The recovery values of Qu and Ir from urine were of 68.5–73.3% and of 75.1–77.4%, respectively. The level of expected concentrations after intravenous administration of Qu was a priori rather complicated to establish. The procedure of fivefold dilution of biosamples with blank plasma was validated in order to prepare a routine analysis. Validation was performed according to Precision and Accuracy parameters. The obtained results of assessment of these parameters were as follows: R.S.D. for both analytes was not greater than 6.3%, RE for Qu was less than 14.4, and for Ir < 14.8%, which confirmed the validity of the dilution procedure . The stability study was performed using model biosamples containing Qu and Ir in respective blank biological matrix. It was established that analytes are stable after undergoing three freeze-thaw cycles, as well as after defrosting the samples and keeping them at room temperature for 4 h. Additionally, it was shown that analytes are stable when the abovementioned biosamples were stored at the temperature below minus 70 °C for 108 days. Storage time of the real biosamples did not exceed 103 days. The stability of solutions in an autosampler for 18 h was also demonstrated. The mean RE values for all the concentration levels and above listed stabilities tested were not greater than 15%, i.e. they met the established acceptance criteria . The stability of the stock solutions of analytes for 3 months, and IS solutions for 22 days that were stored at the temperature of + 2 to + 7 oС was also demonstrated with RE < 3.7%. Figure 4 shows the mean plasma concentration/time profiles of free Qu and conjugated metabolites of Qu, free Ir and conjugated metabolites of Ir, and summarised: free Qu and Ir and conjugated metabolites of Qu and Ir. The basic pharmacokinetic parameters of these curves are shown in Table 2. The table shows that Qu is rapidly metabolized upon administration (the infusion time was 15 min, this was the first time point to sample) to form both glucoronide and sulphate conjugates, and, in a less degree, methyl metabolites and their conjugates. Over this time about 45% of Qu is metabolized; at that, about 28% of Qu forms sulphate and glucuronide metabolites, about 5% turns into metabolites being methylated Qu, and 12% – into sulphate and glucuronide conjugates of methylated metabolites. Free Qu was not detected in plasma of any volunteer in 1.5 h after infusion. T1/2 of free Qu and free Ir are 0.13 and 0.18 h, respectively, which indicates a very rapid metabolism of aglycones, which also is confirmed by high elimination constants of these substances (6.08 h− 1 and 4.02 h− 1, respectively). At the same time, the parameter T1/2 for conjugated Qu, conjugated Ir, and total Qu are 6.90, 4.40 and 5.80 h, respectively, indicating their relatively slow excretion from the body (elimination constants of these compounds are 0.11, 0.19 and 0.13, respectively). The highest value of Cmax was observed for the total Qu at Tmax = 0.25 h, i.e. immediately after infusion that is natural for injectable drugs. When determining Qu and its methyl metabolites in terms of Ir in urine, it was found that free Qu and Ir in urine were absent at all time points. This is natural, taking into account the rapid metabolism of these compounds to the sulphate form and glucuronide conjugates. Figure 5 shows the elimination rate/time curves for conjugated Qu, conjugated Ir, and total Qu. Table 3 demonstrates the basic elimination pharmacokinetic parameters of these substances in urine. For the points where the volume of urine samples was equal to zero and which were not end points, the mean elimination rate equal to the mean elimination rate at the previous and following time points was taken. The cumulative weight of total Qu eliminated in urine over 24 h was 4.57 μg, which is about 10.2% of the infused Qu. Thus, the obtained data on the pharmacokinetics of Corvitin represent the full characteristic behaviour of Qu and its metabolites in the human blood beginning from its intravenous administration. We developed a new quantification method for quercetin and its metabolites in plasma and urine by using L-cysteine as an antioxidant. The method is based on the solid-phase extraction of quercetin and products of its enzymatic hydrolysis followed by the analysis of an extract by the UPLC-MS/MS method. The method was successfully applied in the pharmacokinetic study of the parenteral formulation of quercetin used in medical practice. We thank to SIC ‘Borshchahivskiy Chemical-Pharmaceutical Plant CJSC’, Ukraine for funding the study. SIC ‘Borshchahivskiy Chemical-Pharmaceutical Plant CJSC’, Ukraine. The study was approved by the Central Ethics Committee of Ministry of Health of Ukraine (resolution #5.12–194/KE from 04.03.2099) and by the Local Ethics Committee (resolution #01/19 from 10.03.2009) with minor amendments to the trial protocol (resolution #02/19 from 27.03.2009).